In this tutorial,you will learn how to create a Skyscraper with functions in Minecraft using Microsoft MakeCode. City in Minecraft created entirely out of code. ​2. Copy the code exactly as it appears below (alternatively, you can download the code sample below). 3. Open Minecraft and click on 't' top open the chat window. 4. Type in 'skyscraper' in the command line (followed by the Enter key) to run your code. 3. Select lines 5 to 11. Cut the highlighted lines of code (A) and paste them (B) onto line 16. 5. Open Minecraft and click on 't' top open the chat window. 6. Type in 'print' in the command line (followed by the Enter key) to run your code. Change the size of the skyscraper by modifying the height and width. The current dimensions are: height = 10 and width = 5. ​Create new variables to store the height and width. 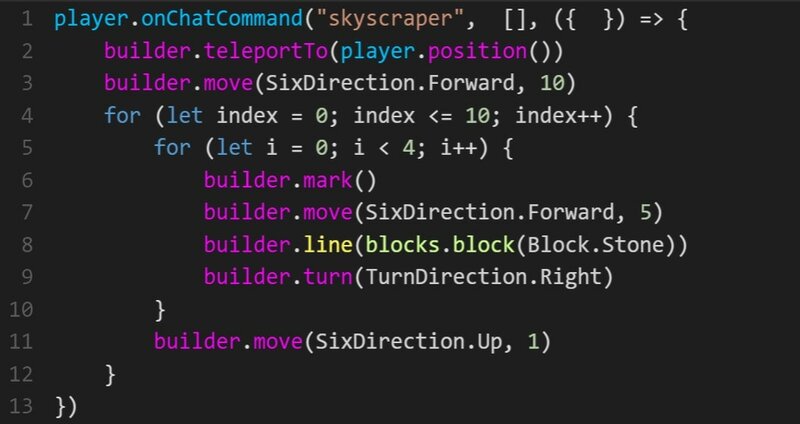 Generate a random number for the height and width to create a different size skyscraper each time you run the code. Comment your code to explain how the code works. Now that we have made the code to create a floor a new function, we can do something really cool. Let's modify our new function to allow it to pass variables so that each time we call our function we can define which blocks to use. ​5. Make sure your code looks exactly as shown above. ​Open Minecraft and click on 't' top open the chat window. Add new floors or use different blocks (such as colored glass or TNT). Modify your code so that it creates a city full of skyscrapers (each a different size).